For those who seeks a very luxurious hotel among others, Harmoni One Convention Hotel & Service Apartments is the answer. it feels like you don’t have to step your feet out of this hotel because its serve you a great quality of rooms, decoration and services. The location are strategic. Only 0.8 km from Batam Center Ferry Terminal, Batam Center Shopping Area and Mega Mall. Other than that Harmoni One Convention Hotel & Service Apartments located 7.92 km away from Hang Nadim Airport. Harmoni One Convention Hotel & Service Apartments provide some facilities such as a large yet comfy pool, steam room, sauna, car rental, airport transfer, shops, business center, fitness center and game room. the hotel fare is around RM 168 per night. Do not forget to check out Traveloka site for it best prices. 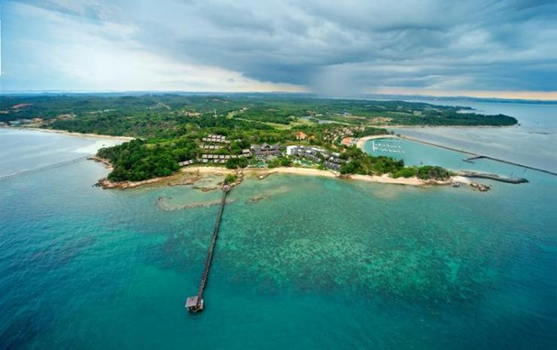 Need a best holiday experience in Batam coastline? Turi Beach Resort is the answer. it serve you a very beautifull scenery, relaxing ambience, and unforgetable experience while you stay. Turi Beach Resort is perfect for couple who wanted to take their honeymoon gateway. But, it also a good place to spend your time with whole family or friends. There are 4 different rooms provide including a premier beach front room and deluxe beach front room. The facilities that available are business center, family room, tours, billiard, outdoor tennis court, ballroom, massage, private beach, car rental, tennis, and golf. Other than that there are watersport available such as jet ski, diving, wind surfing, beach volleyball, canoeing, sailing, banana boat, and waterskiing. 3 stars rated hotel, Jl. Pembangunan, Nagoya, Batam, Indonesia, 29444. Da Vienna Boutique Hotel have a strategic location, especialy for those who loves to shop. Da Vienna Boutique Hotel nearby Nagoya Hill Mall within 0.5 km. You definetely can walk by to go there. The transportation from and to Da Vienna Boutique Hotel is easy because of its location. If you manage to travel with ferry, Da Vienna Boutique Hotel only 2 km away from Harbor Bay Ferry Terminal. The hotel is very luxury and shopisticated. Suits for everyone who wanted a pleasant holiday. There are some facilities you can enjoy such as swimming pool, hair salon, restaurant, family room, laundry service, supermarket and money changer. The staff are friendly and polite. Da Vienna Boutique Hotel minimum fare around RM150.00 per night. The one finest hotel nearby Harbor Bay Ferry International Terminal. It cause Harbour Bay Amir Hotel became one of the most visited hotel in Batu Ampar Batam. The location also near from Nagoya Hill Mall within 2 km, Batam Polytechnic and Maha Vihara Duta Maitreya Buddist Temple within 5 km approximately. It a nice place with nice service as well as a good reasonable price. Staying at Harbour Bay Amir Hotel only costs around RM 78 per night. Its quite fantastic regarding their facilities available such as nightclub, shops, supermarket, conference room, computer station, massage, spa, sauna, money changer and also car rental. Batam City Hotel is the most simple and comfortable hotel among others. It located only within 1 km away from Nagoya Hill Mall, 2.4 km away from Harbor Bay Ferry Terminal, and 2.9 km away from Maha Vihara Duta Maitreya Buddhist Temple. The strategic location allow you to walk surround the hotel and find many great Indonesian food nearby. the facilities available are spa, car rentl, meeting facilities, tours and laundry services.